We’ve all been there; you want to upgrade your armour for Destiny 2: Forsaken but can’t because you need the pulsating grossness that is Alkane Dust. Where can you get some, and how do you find it quickly? As luck would have it, we’ve uncovered the best ways of farming this material so you don’t have to. Found on the water-logged moon of Titan, Destiny 2 Alkane Dust is available in a few different forms. Individual pieces can be found dotted around the level, and hunting them down isn’t too difficult thanks to Titan’s small size (you can find a list of their hiding places on the second page of this guide). 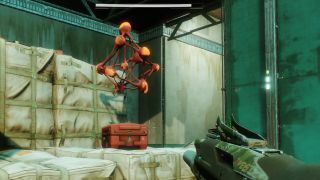 These disgusting balls-of-nope can also be received by completing Bounties, finding chests, and finishing Patrols or Public Events. The latter is the quickest way of getting Alkane Dust in bulk. First, visit Sloane in Siren’s Watch and pick up each of her daily Bounties. These tend to be simple missions like getting 30 grenade kills or destroying a certain number of enemies using Arc damage, for example. Completing a Bounty gets you 10 Alkane Dust, and this is the highest pay-out available on Titan. However, you’ve got to finish whichever Bounty you pick up within 24 hours. Once you’ve grabbed Sloane’s Bounties, head to the nearest Public Event. Although taking part in them only gets you 2 Alkane Dust (regardless of whether it’s Heroic or not), you can usually be completing those Bounties at the same time. Make sure you’ve accepted any kill-based Patrols nearby as well (represented by the white triangle when you pull out your Ghost). You can complete these while fighting in a Public Event, gaining 2 more Alkane Dust in the process. Rinse and repeat for a whole ton of Dust. For an even more lucrative trip to Titan, equip the Moon of Saturn Ghost shell that you received during the Destiny 2 campaign. This highlights enemy treasure chests when you get within 30 metres, and they carry 2 more Alkane Dust each. Grabbing these randomly-spawning chests as you make your way between Public Events should give you all the Dust you need. Helpfully, the shell also marks out individual Alkane Dust nodes on you radar when you’re close. Meanwhile, make Region Chests a priority if you haven’t found them all yet. These golden loot caches net you 6 Alkane Dust a pop, and they’re not all that difficult to hunt down – they’re somewhere near the cross symbol on your Director. If you want to find them quickly, check out our guide. The same is true of Lost Sectors, although these are slightly more work. A semi-circle sign will be daubed on your map and part of the environment near a secret entrance, and this leads to difficult foes guarding another chest. Beating them and opening said chest earns you 4 Alkane Dust. As before, see our helpful guide if you need help pinning these Sectors down. Of course, you can always bypass this legwork and go straight to the Spider on the Tangled Shore if you’d prefer. He often sells Alkane Dust to those with the cash to pay for it, but be warned – the price is steep and it changes on a daily basis.